Justin Hart discusses his studies and findings within robotics. Justin Hart is a postdoctoral fellow in the Collaborative Advanced Robotics and Intelligent Systems (CARIS) Laboratory in the Department of Mechanical Engineering at The University of British Columbia, where he is supervised by Professor Elizabeth Croft. At UBC, his research focuses on enabling humans and robots to effectively communicate and collaborate with each other. As part of this, he is working on enabling machines to make inferences and predictions about human behavior, and perform self-reflective reasoning processes in order to effectively collaborate on human-robot collaborative assembly tasks. TICKET LOTTERY REGISTRATION WILL OPEN APR 17TH - please JOIN WAITLIST to obtain a ticket. See below for more info. Justin Hart is a postdoctoral fellow in the Collaborative Advanced Robotics and Intelligent Systems (CARIS) Laboratory in the Department of Mechanical Engineering at The University of British Columbia, where he is supervised by Professor Elizabeth Croft. 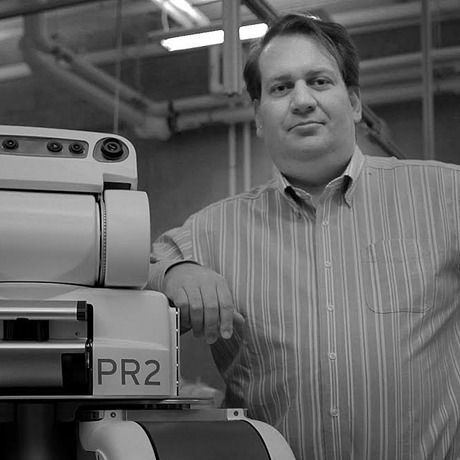 At UBC, his research focuses on enabling humans and robots to effectively communicate and collaborate with each other. As part of this he is working on enabling machines to make inferences and predictions about human behavior, and perform self-reflective reasoning processes in order to effectively collaborate on human-robot collaborative assembly tasks. Dr. Hart received his Ph.D. in Computer Science from Yale University in November, 2014, where he was advised by Professor Brian Scassellati. For his dissertation, “Robot Self-Modeling,” he developed a system that enabled a robot to make inferences about its body and senses through data sampled during operation. This process is inspired by the process by which children learn about their sensory and physical capabilities and how they are able to interact with the environment; which represents one of the earliest forms of self-awareness to develop during infancy. Dr. Hart’s work has appeared in New Scientist, BBC News, NBC News, Business Standard, CBS SmartPlanet, El Mundo, the Yale Graduate School Newsletter, GE’s Focus Forward Films, and at the Ideacity conference. More on Dr. Hart’s work can be found at [http://justinhart.net].